Vowel teams are probably the most common source of reading and spelling errors as one vowel sound may be represented by as many as 6 different vowel teams (e.g. long ‘o’ represented by ‘oa’, ‘ow’, ‘oe’, ‘o_e,’ ‘ough’ and ‘ew’ as in sew). There are 25 standard vowel teams and, consequently, it is vital that they are taught well. In this month’s blog post I am going to examine how to teach vowel teams. 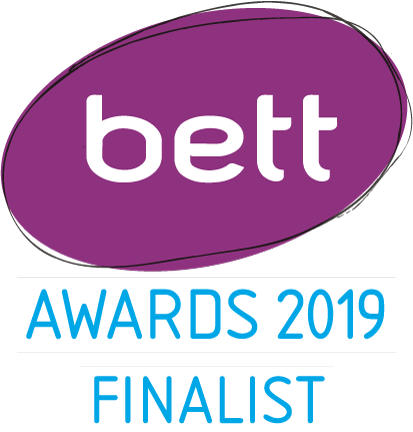 They are the focus of Part 2 of Phonics Hero and additional vowel teams (‘oi’/’oy’, ‘ow’/’ou’, ‘oo’, ‘aw’/’au’) are introduced in Part 3 (grab yourself a free Phonics Hero Teacher Account here). To teach vowel teams well, you firstly need to understand how they work. We have 18 vowel sounds in English but only 5 vowel letters with which to represent them so it is necessary to use combinations of the vowel letters. The correct terminology for 2 vowels working together to represent one sound is ‘vowel digraph’. The letters ‘y’, ‘w’, ‘gh’ and ‘r’ are also used in representations of vowel sounds (as in ‘ay’, ‘ow’, ‘igh’ and ‘er’), so I quite like using the term ‘vowel teams’ with younger students . I use the terms “weak” and “strong” vowels rather than “short” and “long” vowels as it is hard for young children to understand what is short or long about them (long vowels require two mouth movements rather than one – a bit complicated for a six year old!). I’ll be using those terms to refer to the sounds represented by vowel teams. Why are consonant letters used in vowel teams? There is logic to the use of consonants in vowel teams. We use the letter ‘y’ in vowel teams because English words can’t end in ‘i’. The ‘y’ stands in for the ‘i’ at the end of a base word (e.g. hail/hay). English words can’t end in ‘u’, so ‘w’ (literally a double u) stands in for the ‘u’ at the end of a base word (e.g. bout/bow). A diphthong is not a new type of uncomfortable underwear, but rather one (complex) vowel sound formed by the combination of two vowel sounds in a syllable. It is sometimes referred to as a “glide” because the mouth glides from the position for one vowel to the position for another. There are 8 English diphthongs, including the vowel team pairs ‘oi’/’oy’ and ‘ou’/’ow’. Most vowel sounds are made with the mouth in one position, making one pure sound e.g. /a/. The vowel digraph teams ‘ee’, ‘ie’, ‘oe’ and ‘ue’ are used in common words while ‘ae’ is used in a few technical words e.g. ‘aerate’ and ‘aesthetic’. Split digraphs are separated members of a vowel team – they are separated by a consonant, for example the ‘ie’ in ‘bike’ is split to become ‘i_e’. Split digraphs combine the letter ‘e’ with the five vowels to represent strong vowel sounds. When talking about split digraphs, be careful of the language you use. Do not use the terms “fairy e”, “magic e”, “bossy e” or “silent e”, as they do not help a student to understand the logic of our code. The ‘e’ is no more “silent” when it is split from its team member (as it is split in ‘eve’, ‘line’, ‘bone’, ‘rude’ or ‘cave’) than when it was right next to the other vowel. We are still looking at an e-controlled vowel spelling. Likewise, there is no logic in “silent letters” – all letters are silent! Nor is the letter ‘e’ more bossy than any of the other vowels that come second in a pair. This is a focus of Part 3 of Phonics Hero. When you come across alternative pronunciations for the vowel digraphs, take the time to discuss the other uses, to clarify any confusion. Why do we use gh in vowel spellings? The ‘gh’ combination, like in the word ‘high’, was inherited from the Germanic languages that had an impact on English. We used to pronounce the ‘gh’ in Old English, but as something like a ‘k’ sound e.g. the Gaelic word, lough (loch). The German for ‘light’ is ‘licht’ and ‘night’ is ‘nacht’. When Middle English changed to Modern English, the sound was dropped or, in some words, changed to the softer ‘f’, as in ‘rough’. The ‘gh’ has been left in the spelling to show the word’s origin. Teach the most common vowel sounds first – the strong /e/, /i/, /o/, /a/ and /u/. Part 2 of Phonics Hero will systematically take you through this logic. 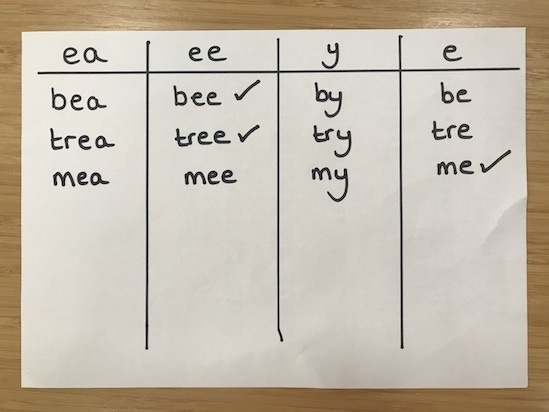 In spelling instruction, teach the most common vowel team spellings of a vowel sound first e.g for the long ‘a’ sound teach ‘ai’ before ‘ay’ and eventually ‘eigh’ as an extension for those who can manage the more advanced logic. In reading instruction, teach the most common pronunciation of a vowel team first e.g. ‘ey’ as long ‘e’ (e.g. ‘donkey’) before ‘ey’ as long ‘a’ (e.g. ‘they’). Teach irregular vowel team spellings as camera/tricky words e.g. ‘people’ and ‘leopard’. DO NOT teach “when two vowels go out walking, the first one does the talking”. While it holds true for some common words, this pattern is true in less than 40% of vowel team pronunciations e.g. it does not apply in ‘oi’, ‘au’, ‘ou’ and ‘ew’ and in r-controlled vowel teams, such as ‘our’ – the vowel sounds are completely changed. Given the number of influences on the English language, it is better to talk about “usual”’ patterns rather than use the term “rules”. Teach the logic of the code in regards to the placement of vowel teams e.g. English words don’t end in ‘i’ so ‘ai’ is used in the middle of a base word and ‘ay’ at the end. They don’t end in ‘u’ so ‘ow’ and ‘aw’ are used at the end of a word, not ‘ou’ or ‘au’. Teach the patterns explicitly e.g. ‘ai’/’ay’, ‘oi’/’oy’, ‘ei’/’ey’. If students are to use plastic or magnetic letters in vowel team work, be sure to buy those that have the digraph as one piece. Use sound (Elkonin) boxes and/or sound buttons to highlight the fact that a ‘team’ can represent a single vowel sound. To help students understand split digraphs, have them identify the component sounds of a word (e.g. ‘cake’ includes /c/, /a_e/ and /k/). Have them represent the e-controlled vowel spelling as ‘ae’ on paper then cut the letters apart and insert the consonant (in this case, ‘k’). 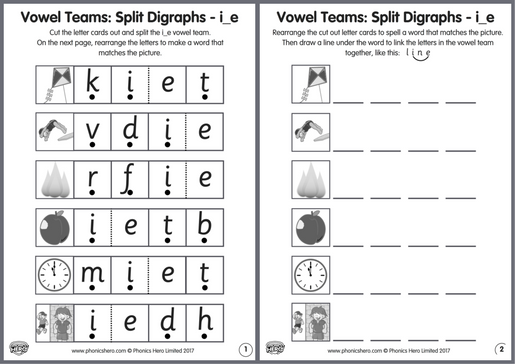 We’ve made a worksheet for each of the split digraphs – download our FREE worksheets here. Use Phonics Hero’s FREE worksheets! Help students understand the power of a vowel team’s ability, together or split, to make a strong sound by teaching weak/strong pairs, such as bit/bite, mad/made. Use plastic or magnetic letters that have vowels in a different colour to consonants as the difference highlights the teams. Because there are no rules that tell us when to use certain representations of vowel sounds, other than placement rules related to use of ‘i’ or ‘u’ at the end of words, mastery is dependent on familiarity with words. Use of Phonics Hero is ideal for giving students multiple exposures to each word, in reading and spelling. Get started with a free Teacher Account here. If children are unsure which spelling choice to use, suggest that they have a go with a vowel table, like the example below. They should try each spelling choice and make a decision as to which one looks right. A vowel table will help children identify the correct vowel team. The Phonics Hero games also enable a student to have a go and make the decision about which one looks right. 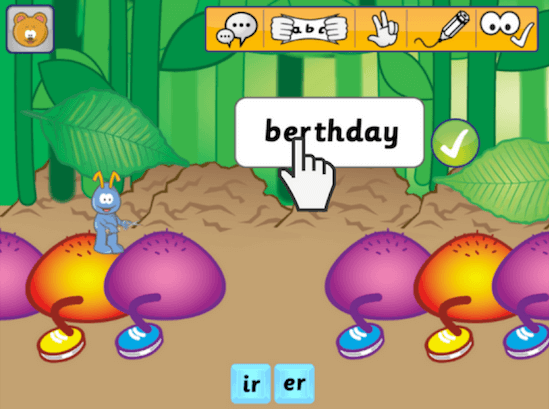 In the example below, a child is having a go at representing “birthday”. Children can try each spelling choice, clicking it to remove it, and clicking the tick when they have made a decision. Practise choosing the right vowel team with Phonics Hero. 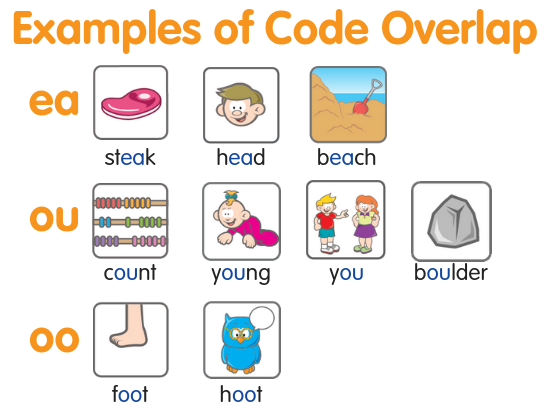 Do phoneme searches for representations of a vowel sound or vowel team searches for code overlap in decodable text. Create a vowel sound chart with your students, showing the various ways of spelling a vowel sound and a key word/picture as a memory jogger. Create a copy, cut it up into cards then have students do a word/picture sort, recreating the chart. In tutoring, I like students to select an image of each spelling that is meaningful to them. Together, we create a reading or spelling slide show with each slide showing the vowel teams for a particular sound with an image for each, e.g. one little girl in love with all things “Frozen” chose as her long ‘o’ images: snow for ‘ow’, Olaf for ‘o’, and the advertising picture for the Frozen movie for ‘o-e’. There are lots of activities involving games and movement that you can use to teach vowel teams. Here’s one idea: Save the lanyards with plastic card holders from Professional Learning you go to. Write the vowels, w, y and gh on cards in one colour. Write consonants on cards in another colour. Put the cards into the holders. Ask students to each wear a lanyard. Call out a word and ask the students wearing the required letters to stand in order to spell the word. Who will be part of the vowel team representing the vowel sound will be a source of discussion. This activity emphasises the need for a team effort. Be sure to make your vowel team teaching systematic, explicit, sequential, multisensory and cumulative.